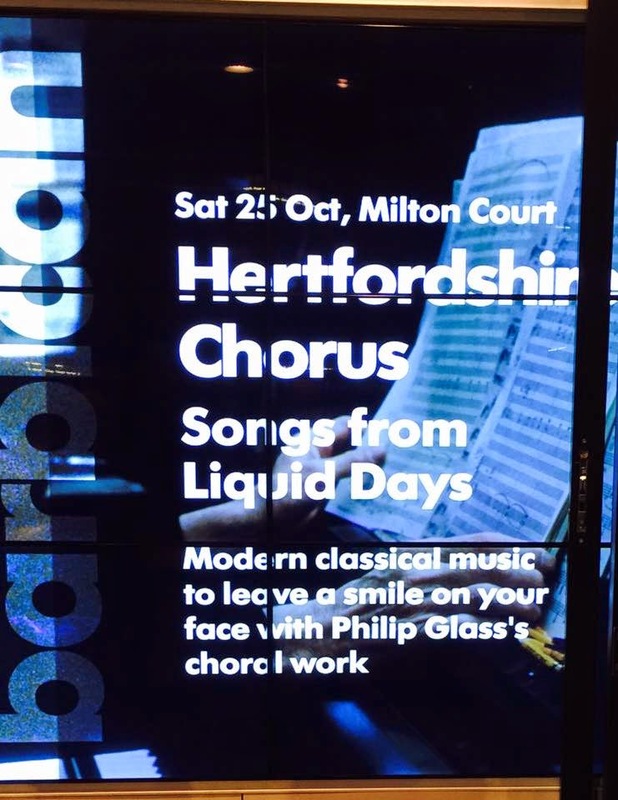 Last Saturday night I went to the Milton Court Concert Hall in London glitzy Barbican area to see the Hertfordshire Chorus with David Temple conducting the London Orchestra da Camera. The lovely Gavin Davies was playing the fiddle in the band - which was a lovely surprise. The first piece performed was Handel's Dixit Dominus and that was followed by Philip Glass's Songs from Liquid Days arr. Jeremy Marchant. Songs from Liquid Days brought tears to my eyes - especially during Open The Kingdom and Forgetting. The soloists were:- Zoë Brown soprano, Esther Brazil soprano, Clara Sanabras mezzo-soprano and Robin Green tenor. I was slightly disappointed we had neither Margo Leadbetter nor Miss Mountshaft fighting to play the soprano lead though. We're glad you enjoyed our concert and hope you'll come and see us again soon!